The Cabinet of Ministers at its meeting on Wednesday, June 24, will consider the dismissal of Ihor Shevchenko from the post of Ecology and Natural Resources Minister, Deputy Prime Minister Valeriy Voschevsky has said. "Both the [Batkivschyna] faction, and the coalition are currently discussing this issue," he told reporters in Kyiv on Tuesday. According to Voschevsky, the Ukrainian Prime Minister Arseniy Yatseniuk has already submitted a proposal to dismiss the Shevchenko. 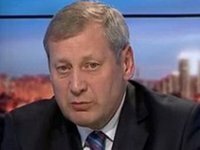 Voschevsky also said that the audit of the Ecology Ministry's activities showed that the minister didn't perform his duties properly. "The person who runs this ministry does not understand his duties," he said. According to Voschevsky, Shevchenko has not held a single meeting in the ministry and hasn't solved the issues of financing the work of some of its departments. As reported, Leader of the Radical Party faction Oleh Liashko urged Yatseniuk and MPs to fire Shevchenko as he had gone abroad when there was an ecological catastrophe in the country, namely the fire at the BRSM oil depot. On June 22, Yatseniuk asked Batkivschyna to consider whether Shevchenko should remain in office. Shevchenko confirmed that he flew on the plane of MP Oleksandr Onyschenko from Nice, but said he did not believe it was corrupt to do so. He said that he watched football in Berlin, where he travelled to via Dresden. Shevchenko was appointed under the Batkivchyna faction quota.